North Korea has claimed that the missile it tested on Sunday was a new type of rocket capable of carrying a large nuclear warhead. The missile, launched at a steep angle, reached an altitude of 2,000km (1,242 miles) and travelled about 700km, landing in the sea west of Japan. North Korea said on Monday it was a test of the abilities of a "newly developed ballistic rocket". South Korea's military said it could not yet verify the North's claims. But it said the North's missiles did appear to be able to leave and re-enter the atmosphere, which is crucial to developing intercontinental ballistic missiles (ICBMs), the Yonhap news agency reported. Repeated missile tests by the North this year - not all of them successful but all a breach of UN sanctions - have sparked international alarm and raised tensions with the US. UN Secretary General Antonio Guterres condemned the launch on Monday, saying it was "in violation of Security Council resolutions and a threat to peace and security in the region". The US and Japan have called for an emergency meeting of the council on Tuesday. While unusual, this sharp trajectory with an extremely high altitude allowed North Korean scientists to test the range of the missile without directly flying over any neighbouring countries. The altitude would also allow the North to test the atmospheric re-entry vehicle under the extreme heat, pressure and vibration. The KCNA noted both facts in its public statement. This "lofted" trajectory would be equivalent to over 4,500km if launched at a standard trajectory, putting US bases in Guam well in range. It is indeed the longest-range missile North Korea has ever tested (aside from its space launch vehicles). What do we know about North Korea's new missile? 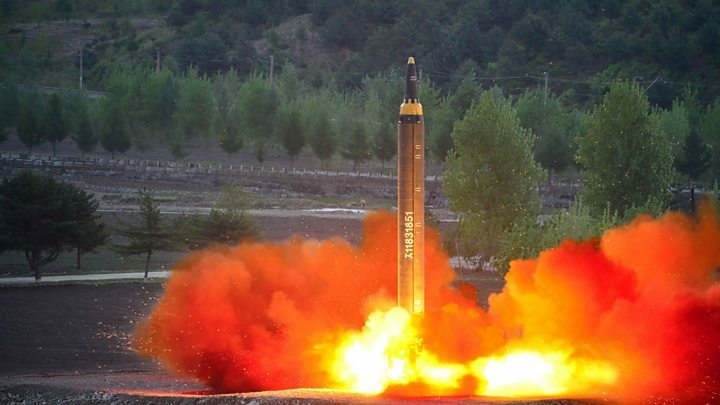 North Korea's KCNA state news agency said the test of a "newly developed mid/long-range strategic ballistic rocket, Hwasong-12" had gone to plan. "The test-fire aimed at verifying the tactical and technological specifications of the newly developed ballistic rocket capable of carrying a large-size heavy nuclear warhead," it said. Stephen Evans: Is Kim Jong-un rational? 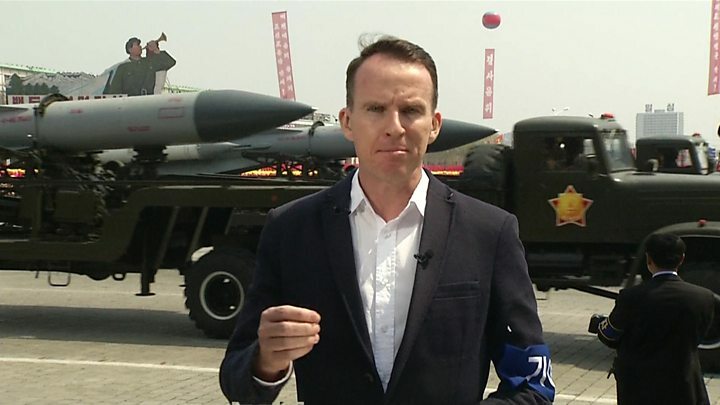 North Korea is known to be developing both nuclear weapons - it has conducted five nuclear tests - and the missiles capable of delivering those weapons to their target. Both are in defiance of UN sanctions. But it remains unclear whether it has the ability to make the weapons small enough to be mounted on a rocket, and it has never tested a long-range ICBM which could reach, for example, the US. ICBM's are considered to have a range of about 6,000km, but analysts believe the missile tested on Sunday would have travelled about 4,000km if it had been fired at a standard trajectory rather than upwards. The KCNA report said that, as ever, the test had been overseen by the North's Supreme Leader Kim Jong-un. It said he had told the scientists and technicians involved "not to be complacent" but to build further "nuclear weapons and methods of delivery" until the US made "the right choice". The White House has mooted talks with North Korea under the right conditions, which would include a halt in missile tests. But in a statement on Sunday, it said Pyongyang had been "a flagrant menace for far too long" and that this "latest provocation" should "serve as a call for all nations to implement far stronger sanctions". The US ambassador to the UN, Nikki Haley, said on Sunday that until Mr Kim meets the US conditions, "we're not sitting down with him". South Korea's newly elected President Moon Jae-in, who is seeking deeper engagement with the North, said it was a "reckless provocation" while China, North Korea's only real ally, is urging restraint. Have missile tests paid off? North Korea: What can the outside world do?